I've read conflicting information regarding Internet Explorer's silly CSS limits. I am (think I am) understanding that you can only have 31 <style> and <link> tags (combined), and that each sheet can have up to 31 @import-s (so 31 <link>-s, each to 31 @import-s is fine, albeit insane). However, the 4095 rule is less clear - is this 4095 rules per document, or per sheet? For instance, can I <link> to two stylesheets, each with 4000 rules, and have it work, or will this break the limit? On this msdn blog post stylesheet-limits-in-internet-explorer further information is given. By way of confirmation, I've created a gist with 3 files. One HTML, and two CSS files. The first file contains 4096 selectors and means that its final selector doesn't get read in. The second file (4095.css) has one less selector, and gets read in, and works perfectly in IE (even though its already read another 4095 selectors from the previous file. I don't have enough rep to comment on the above similar snippet, but this one counts the @media rules. Drop it in Chrome console. Might be handy for those of you still fighting with older IE versions / large CSS files. I think it's also worth noting that any CSS file larger than 288kb will only be read up until that ~288kb. Anything after will be completely ignored in IE <= 9. My advice is to keep CSS files for larger applications split up into modules & components and keep a constant eye on filesize. Not the answer you're looking for? Browse other questions tagged css internet-explorer stylesheet or ask your own question. How do I fix twitter-bootstrap on IE? 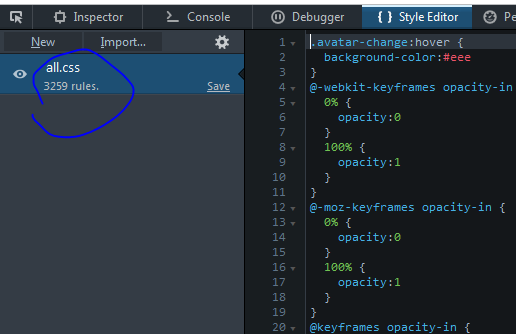 How are media queries counted in IE's CSS selectors limit? What are the limits to the size and quantity of css files from browser to browser?